Cover your ears for a second. My wife can sing. I can’t. But, we do have one thing in common — we both think we can. Only one of us is right (ahem). Your job is to help your clients find their voices — their rhythms and their “keys.” Are they sending out a track so bland, flat, and “elevator worthy” that it is either ignored or irritating? Many do. This is where you come in. You’re their Voice Coach. What is a Voice Coach? A Voice Coach is just that … a coach. Your job is not to dictate who and what they are, or even how they need to precisely sound to their customers. Your job is to ask the right questions and pose the right methods to draw out their talent. Then you become their lyricist or songwriter and do the work of “mastering” (the act of finalizing a mix and compressing it) their content. To take the best part of them and put it in written form. To identify their stage and be their microphone. Here are seven questions that help your writing clients develop voices that grow audiences and gain more fans. They’re tips to help them sing it and not just sell it. The first step is always the hardest, but one you shouldn’t skip. You’d be surprised how many “deer in the headlights” faces you get when you ask a client who they are. To help your client know what to say and how to say it, they must first clarify their corporate personality. In Fascinate, Sally Hogshead describes the seven most effective brand profiles. Every business has both an internal and external personality, and therefore, a reputation. If I were to visit your headquarters, what would I find? How would I feel? How do the employees view their jobs? What do customers say about your services or products? Encourage them to speak openly, rather than imitate another company or present an inauthentic message. 2. What is their hook? The only thing as bad as someone who can’t sing is someone who is singing crappola. In the same way, all the technology and marketing in the world won’t help a company with no driving message. What is the one benefit they can promise their customers? What promise makes them stand out from all the rest? This main benefit/promise will lead their marketing efforts. It is embedded in the chorus of their content and gets people humming and tapping their feet. This “hook” is their main message to their customers. It is the one you will be consistently writing about. Once you help them succinctly and clearly communicate this promise, it will be your job to amplify it. 3. What is their verse? 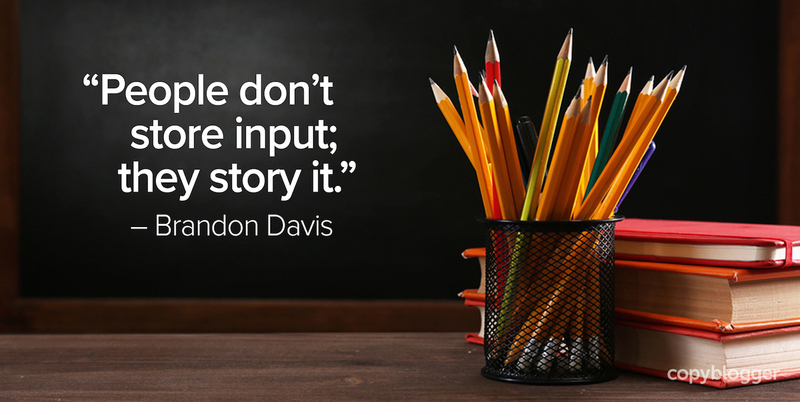 People don’t store input; they story it. They are hammered every day with loads and loads of information. If all your clients do is put out more deals and offers, they’ll have a difficult time standing out. How a business interacts with their customers and enhances their lives becomes their story. It is the verse of their song. You will have the amazing opportunity to tell your client’s story where their customers are the heros and they are the guide. Where they are Obi-Wan and their customer is Luke Skywalker. Where they are Linguini and their customer is Remy. In addition to the components of their content marketing strategy, About Pages are great places to do just that — and show your clients that they shouldn’t only talk about themselves. Because guess what? No one cares. People care about their own stories. Prospects ask how a company can help them succeed or thrive in life. 4. Who is their target audience? That means their voices will be much more effective and powerful if they laser in on one particular user/buyer when they write content. They don’t want to give a speech to the masses. They want to have a conversation with one person. For example, if their product appeals to a 20-year-old male college student, they might attract his 65-year-old grandmother who is looking for the perfect gift for her grandson. It may seem counterintuitive but it works. If you speak to everyone, you end up speaking to no one. Instead of turning the volume up, you will be turning it down. 5. What are people already saying? An effective voice reflects the public’s view of your client. Brands are birthed and thrive in the glowing fire of publicity. Marketing and advertising are just throwing gasoline on it. Research what their customers are raving about on social media or Google Reviews. Once you have identified those highlights, you can join the choir. 6. How will it look? Many businesses have trouble getting heard because the venue they are singing in is just plain unsightly and/or inconvenient. I’ve personally noticed that my food can actually taste different when dining in a restaurant with no interest in decor or cleanliness. In order for your client’s voice and message to be accepted with delight, they must be in accordance with aesthetically pleasing and user-friendly elements. Having a website that is designed well and functions properly on rock-solid hosting is crucial. They need a clean and professional digital headquarters to do all the things mentioned in the earlier tips. If you don’t also provide web development and design, you can direct your clients to those service providers. 7. What brings them joy? Listen for the things they are excited about. As you write for them, you need to have fun as well. At the end of every project, there should be lots of smiling faces. They had their joys written about. You had joy writing about them. Their customers had joy when reading and responding to them. That is the kind of voice everyone wants to hear, and it will always call for an encore. Brandon is one of Copyblogger’s Certified Content Marketers. The Certified Content Marketer training program is a powerful tool that helps you attract better clients — and more of them. Brandon Davis ("The Copy Rocker") is a writing enthusiast, wanna-be composer, and husband to a beautiful singer/songwriter and father of two precious little girls (one in heaven). His other loves are tats, tacos, and if he had time … fishing. Brandon is also the Senior Copywriter for the Digital Marketing firm SEO Skyrocket and its partner company SkyrocketWP. I’m not a writing coach or anything like that. But I do like to guide people and help them with great insights about internet marketing and success. It is a good to teach others how to find their own voice for their targeted audience and be themselves while delivering exactly what their niche audience needs and wants. Your own voice is what will separate you from the bunch. You have to add your own personal touches to your writing style. Never be afraid to speak your mind out in the way you want to speak out. Not everyone will like your character and voice, and that is actually a good thing. You only want the people who actually like you to follow you and learn from you anyway, right! But the last one really did it for me. As someone who works with clients that are fun, and clients that can be molasses-slow-type-work, I’d choose fun and interesting and joyful any day. Thanks for the inspiration! Ty all. I’m so glad this post helped you. And Freddy I think the secret is out now lol.